I totally just read a business book for the first time in years. Yes, the irony of this fact is not lost on me. I used to eat up business and self-help books back when I was in college and while I had a steady job during my twenties. But during the past two years that I have been self-employed while running my blogging business full-time — the time when I probably needed business advice the most — I have barely prioritized time to even get through my book club’s monthly fiction pick, much less dive into the hippest business books, podcasts, blogs and resources available galore. Meh, lame. But I’ve suddenly been bitten by the business development bug, probably because I have all sorts of random project ideas mulling around in my mind. So I’ve decided to dive back into that world. And upon the advice of another blogger, one of the resources I decided to start with was a book I downloaded and read while I was in El Salvador — The Slight Edge. I was kind of hoping for fireworks. But to be honest, it instead reminded me of why I so often end up rolling my eyes rather than nodding my head with business books. It was uber-repetitive, overly self-congratulatory for my taste, and too many of the anecdotes supported the idea of success=money. BUT. Once I was able to get past that, there were actually quite a few nuggets in there that I really liked. And I’ve been test-driving one piece of the book’s advice in particular, and have found it to be really really helpful and do-able and empowering and even seemingly sustainable. 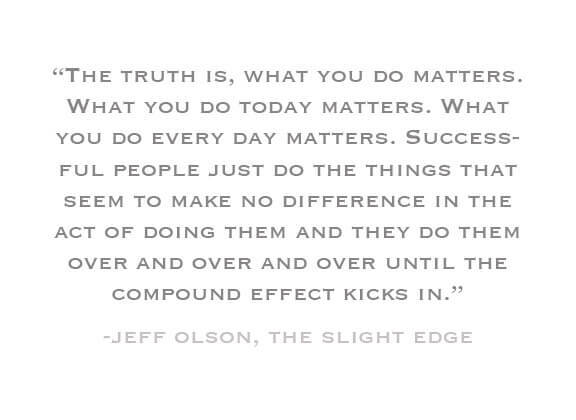 It’s part of this whole concept that the author, Jeff Olson, calls “the slight edge”. It’s basically the idea that it’s the small, subtle and often mundane things that people do on a day-to-day basis that are actually the key to any big successes (or failures) they achieve in life. So he breaks those things down into different points and action steps. And one of those was the idea of “mastering the mundane”, and trying to improve the tiny, seemingly-insignificant decisions that you make in a given day. Because those tiny decisions add up, and they are significant, and they matter. There’s way more to this. But after mulling it over for awhile, the concept somehow morphed in my mind into this goal of trying to make 10% better decisions in a given day. And I’ve been testing it out in my own life, and am kind of digging it. I mega-agree with the book’s premise that the whole of our lives is absolutely the sum of its parts. In that, where I am today is almost entirely the result of a thousand — or tens of thousands — of little decisions that I’ve made throughout my life. Sure, occasionally I have had lucky or unlucky breaks, and life has thrown curveballs that are totally outside of my control. But for the most part, my relationships, my career, my health, my faith, my finances, and my life in general are the result of little day-to-day decisions I make that all add up. Some days, I make really stellar decisions. Some days, I make really lame decisions. Most days, it’s a consistent mixture of both. With me specifically, though, I’ve come to realize that most of my not-so-stellar decisions are often the result of the “all or nothing” paradigm. I once heard someone explain that people either naturally tend to make decisions based on an “all or nothing” or “moderation” mindset. For example, take someone who is trying to quit drinking soda all day at work. The “all or nothing” person would need (and want) to just quit drinking soda cold turkey, because anything gradual would be too tempting and unsatisfying for them. The “moderation” person, by contrast, would need to slowly wean themselves off soda in moderation, because stopping immediately would feel way too sudden and overwhelming. I have no idea if this theory is even true. (And of course, it’s way oversimplified, since there are huge considerations/exceptions to be made when substances or finances or health are involved.) But in general, the idea rings really true with me, because I am 100% an “all or nothing” person. It’s how I’ve always instinctively viewed my options when making decisions. And it’s usually how I’ve made decisions, for better and for worse. For example, when I think about working out for the day, it’s usually 30 minutes on the elliptical…or nothing. When I’m considering what to order when out at a restaurant with friends, it’s often the light salad…or the steak and fries. When I debate whether I have the energy to attend a party, it’s either the whole night…or I skip it all together. When I glance at my inbox that is overflowing with messages, I either plant myself there and power through for an hour or two…or completely abandon it all together. When I question how to spend an unexpected check, it’s either spend it all…or save it all. Sure, it’s not always that black and white, and I have worked over the years to embrace the in between and spontaneity and gray and all of that good stuff. But more often than not, I still err “yay” or “nay”. SO. When I look at the decisions I make in a given day, clearly my “room for improvement” lies with not-so-stellar decisions. Right? Well, one of the things I loved about the book is that they basically slammed the idea that all you need is willpower. Hallelujah and amen. Because anyone who has tried to make better decisions in life knows that willpower is extremely important, but it is definitely not the silver (and only) bullet. You need friends and resources and even professionals to help you, and you need a heck of a lot of grace for the times when you fall short. And speaking from experience, I am not always going to be batting a perfect score with making all of the perfect decisions I want to make every perfect day. But what I’m learning that I can do is pay better attention to how I make decisions, and be intentional about at least taking a split second to weigh the options. Hopefully I make the awesome decision. But if, for whatever reason, I don’t feel like I’m going to be able to go with Awesome Option A, I’m trying to train my mind to remember that the alternative is not only Bad Option B. There’s almost always a creative and in-between Third Option C. Or, as I’ve started to think of it, Option B+10. Basically, trying to make a decision that’s at least 10% better than what your default Option B would have been. Partly because I like 10’s. And partly because it seems like a totally do-able yet significant number. I know. It sounds SO cheesy. But I’ve been trying to live it out lately. And I’m kind of convinced there’s something to it. I was on a business trip in Austin and our hotel didn’t have a gym and I was dog-tired at the end of the day. 30-minute workout? Totally not happening. But instead of going to bed after consuming a zillion taco calories without burning any, I decided I could at least do 10 push-ups. (Which then got my heart rate up, and led me to want to just “squeeze in” 10 crunches, and 10 squats, and 10 lunges.) Definitely nowhere near a 30 minute workout. In fact, it was closer to 2 minutes. But hey, it was at least a 10% better decision than nothing. Or take my inbox. Our group was given a 1-hour break in the afternoon to “freshen up” and catch up on work, and my inbox had spiraled out of control over the 24 hours that I had been in Texas. Part of me totally just wanted to work on plans for my new blog redesign (exciting! ), and part of me wanted to take that hour to try and email back replies (meh!). I decided that I was feeling creative at the moment and really wanted to take advantage of that to work on my new web design. But as a compromise, I made myself sit down and spend at least 6 minutes on email. (Which, again as tends to happen, turned into 10 because I got on a tiny roll.) And then I went onto my other project. I didn’t make an hour’s dent in my inbox, but at least I had the satisfaction of knowing it was 10% better. Other common examples from the past few weeks I’ve been trying this? Eating Out: I’m often torn about how much money I spend eating out with friends. And I also don’t always make the best food choices health-wise when I’m out. (I eat pretty healthy at home, but tend to want to splurge when looking at a menu.) So if I can’t seem to drum up the willpower to go for the most affordable/healthy option, or if it’s a special day and I’m intentionally wanting to splurge, I just try to make at least a 10% better choice with what I order. Financially, that can be as simple as not ordering a drink. Food-wise, it can be as simple as just ordering a healthier side, or cutting the dressing in half, or choosing a lean instead of fatty meat. Just 10% better. Saving: My birthday was last month, and I received a few kind checks from relatives as presents. My impulse on this one was totally “all or nothing”. Should I go shopping and spend it? Or put it away like a grown-up and save, save, save? It was totally my birthday, so I knew that the givers intended me to spend it on a gift. But on the day I went shopping, I decided to tuck away 10% for a rainy day. That part didn’t make any big dent in my savings. But actually what it did do was make me think more about my limits. And instead of impulse spending even above that at the store, I walked in feeling very committed to my spending limit and actually stuck to it. Cleaning/Laundry/Dishes: I hate cleaning. And laundry. And dishes (with a passion). And I tend to want to let all three pile up until they are slightly out of control and require hours to do. But I’m trying to work on the 10% idea here too, and do a 10-minute cleaning pass around my house before bed. And do smaller loads of laundry more frequently instead of building up to one miserable day full of massive loads of All The Laundry. And I’m trying to get better about at least giving dishes a good rinse (10%) before I set them in the sink, and hopefully at least put anything straight into the dishwasher that can go there. Because none of this is rocket science. It’s simply a different little angle to consider at how we make decisions. Might be helpful for some (especially you fellow “all or nothing”-ers). Might not strike a chord at all for others. But hey, I can vouch that it has at least been helpful for me. And I’m already seeing the fruit of how some of the tiny 10%-better decisions I’m making during the day are adding up (or “compounding”, as the opening quote says) to create something noticeable and cool. And how even how those tiny decisions are building a bit of momentum and encouraging me to want to make even more tiny better decisions. And how they’re just generally making my days feel a little more intentional, a little more accomplished, a little more empowered, and a little more awesome. What do you think? Any tips or thoughts to share on making better decisions? I am an all-or-nothing person as well. I accidentally did the 10 percent thing during a workout today — when I hadn’t even read your post! — so it resonated in a good way with me. Hopefully I’ll incorporate this into my life more consciously! On a tangent — a food blogger who loathes doing dishes? What an unfortunate thing to hate! Good thoughts, Amiga. I think I also tend to be an “all or nothing” person, but it’s good to be reminded that here are small victories and progresses and that those are also significant (definitely more than the “nothings!”). I loved this, Ali! I have noticed that as I get older, I turn more and more into an all or nothing person. And I can totally see how that is a dangerous road to go down. I need to remember this, and I love the 10% rule. Makes it totally doable! I LOVE the 10% concept! I’m naturally an all or nothing person, but after 12 years having chronic fatigue syndrome, I am physically a moderation person, and I’ve had to adjust my thinking to match. Unfortunately that often leaves me incredibly frustrated, I have All The Things that I want to do (from working on my baking blog, making flash cakes for my family, to the boring stuff like tidying up after my blog posts) but depending on the day, sometimes if just can’t do it. Such an interesting post Ali! I loved it! I feel the same way about business books. Too much for about 90% of them but the little snipits that are meaningful are so intriguing to me. Thanks for sharing this. I like this 10% thing. Definitely something to think about more. When I make decisions during the day, I almost always use the advice I got way back in the day when I use to listen to Tony Robbins CDs. Yes, CDs. Anyway, the advice is to always focus on the feeling you will get from the outcome, not the process itself. So, for the decision if I’m going to workout: I focus on that great feeling I get AFTER the workout, and that helps me say yes to the workout. I do this with everything I hate. Laundry? Focus on how awesome it feels to have an empty laundry basket and all the clothes put away. Works for me! I really like this, especially the 10% idea. I love this, Ali! I’ve been trying to work on things in the same way, and it definitely helps! I am a HUGE procrastinator and work best when I have a bit of pressure on me to get something done, but that often backfires if I wait too late. Adding just a bit more than I normally would makes a big difference! I loved this!! I’m absolutely an all-or-nothing person. That’s why I often find myself up til midnight working on my blog because I just need to “one more thing” to make it “perfect.” I think I could certainly stand to be more mindful and I love this approach! Oh my goodness, this is exactly what I needed to hear today! And I will be sharing this with my team at work because I think they can all benefit! I used to be an “all or nothing” person, but I realized quite a bit of my personal goals weren’t being met, which made me frustrated with myself. When I realized this, I worked on doing little things towards the goals I wanted to accomplish. I just had to keep telling myself it was okay to stop halfway through. Doing things little by little works for me, and I am much less frustrated with myself! However, if I have the opportunity to go “all or nothing”, I take it. I love this idea! I’m definitely an “all or nothing” gal, so this basic premise will be great to keep in the back of my mind. I love this – thanks for sharing! I am definitely an all or nothing kind of girl and often feel paralyzed by the “yes or no” approach. This is great because it helps define moderation and makes it seem so much more manageable!